Local soil testing contractors will finish soil sampling across 21 farms in the Geographe catchment this week as part of a three year program that is hoped will be a win-win for both farmers and our waterways. The soil testing is part of a three year program that is helping farmers make evidence-based decisions on their fertiliser use. GeoCatch Project Coordinator Bree Brown says soil testing programs undertaken across the south west in recent years show that around 70% of paddocks have more phosphorus than needed to support pasture growth. 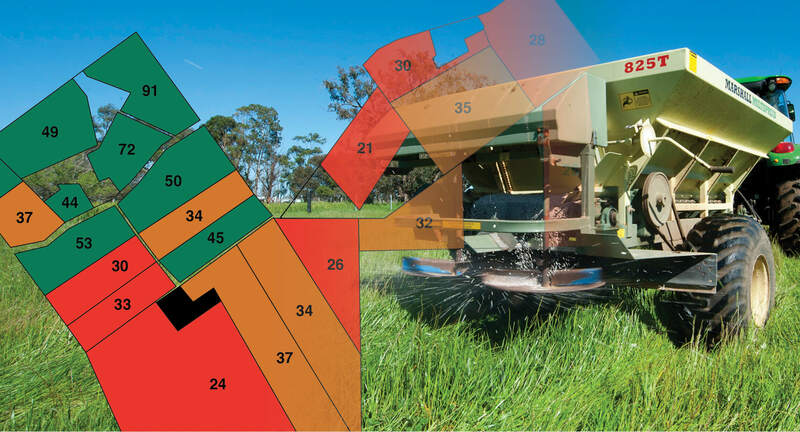 “Our program gives farmers paddock by paddock information to help them fine tune their fertiliser needs. In many cases this leads to a reduction in fertiliser use and a cost saving to the farmer, which is also great news for our waterways” said Bree. Bree says that although pastures used for grazing may seem a long way from our rivers and wetlands, agricultural fertilisers are the major source of nutrients to waterways, where they contribute to water quality problems. With over 46% of Geographe farms having now participated in the soil testing program over the past 10 years, farmers are now seeing firsthand the benefits of having detailed soil information for each paddock on their farm. Yalyalup farmer David Gow says he has found the detailed information received in the program is helping him with his fertiliser decisions. “It’s fantastic to have such thorough information for all of my paddocks, and the maps make it really easy to see what my nutrient levels are at a glance” said David. The next stage of the program following soil testing will be workshops in February where farmers receive their results, maps, and have Department of Primary Industries and Regional Development Officers and local agronomists on hand to discuss results with farmers. Agronomic advice given at the workshop will help farmers fine tune their fertiliser applications, potentially saving money and reducing the risk of surplus nutrients ending up in waterways. Soil testing is just one of the ways GeoCatch and our partners are working to improve water quality in our rivers, wetlands and estuaries under the Revitalising Geographe Waterways program. For more information visit the Revitalising Geographe Waterways website www.rgw.dwer.wa.gov.au.